Editor’s note: This feature originally appeared in the March issue of DS News, out now . 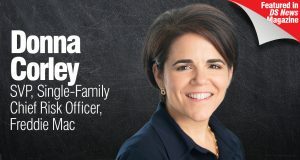 Donna Corley oversees the analysis and management of potential risks to the single-family business at Freddie Mac. In her role as Chief Risk Officer, Corley sets credit policy and manages seller/servicer credit performance while helping to ensure compliance with the GSE’s underwriting standards, loan manufacturing processes, and requirements for originating and servicing loans. Her team also provides models used in underwriting, costing, and servicing. Previously, Corley served as SVP for Credit Pricing, Risk Transfer, and Securitization at Freddie Mac. She spoke to DS News about how technology is changing risk management and why the current environment comes with its own challenges for servicing and underwriting loans. What are some of the chief risks associated with servicing and underwriting home loans? For the longest time, we were happily in a refi environment. But for the first time in a decade, we have a strong purchase market. That means that you have more first-time homebuyers out there. You have people making lower down payments, who will end up having higher debt-to-income ratios. You have a growing demographic of new borrowers who are self-employed. In short, the loans are much more complex. And they are costlier for lenders to originate making margins extremely tight for our clients. That is why we're focusing on innovation and tools that can help our clients focus on the most important areas of their business and to bring better efficiencies by not have any weakening in the risk management practices that they have. As new technology enters the market, what are the strategies being adopted to foster innovation in risk management? We're leveraging new technology to ensure we're making smart risk decisions and helping bring value to our clients. Technology is a critical component of innovation, but in the end, it's part of an overall approach about how we think of problems and how we change the status quo as we try to reimagine the mortgage experience. To help our clients grow and succeed in their business, we need to understand the risks and the tradeoffs of everything that they're contemplating and so much of that comes down to making smart data-driven risk decisions. At Freddie Mac, we’re using technology in three different areas to help foster some of that intelligent risk decisioning in an innovative way. The first area is our Loan Advisor platform that is focused on helping lenders make their process more efficient and fit their underwriting process by using data-filled solutions to drive results and bring the full breadth and expertise of our team into the lenders’ shops. Second, our automated collateral evaluation tool (ACE) introduced about a year ago uses big data and advanced analytics to determine where a traditional appraisal isn't needed, saving time and money for borrowers and lenders. It also helps appraisers focus on the more challenging properties on the market. The third area is asset and income modeling where our modeling platform (AIM) is used to assess our borrowers’ assets and income. In addition, the new AIM for self-employed tool helps assess the income of self-employed borrowers. We have partnered with Loanbeam for this platform, which uses optical character recognition to help lenders extract critical data elements from complex tax returns and ensure that the borrowers’ income calculations meet Freddie Mac's requirements. In the three years since it began, Freddie Mac’s Home Possible has helped more than 262,000 low- to moderate-income households achieve the American dream. How are these loans analyzed from a risk perspective to ensure they don’t go into default? Our mission is to not only get people into homes but make sure that they can sustain homeownership over time. Our automated underwriting engine (AUS) analyzes hundreds of different data points about a loan, a borrower, and the property to help us form our risk assessment for that loan. We then monitor the risk associated with all the loans we purchased, not just the Home Possible ones. While analyzing these loans, we constantly ask questions like, "Are we seeing any challenges or concerns?" and "Do we need to change any of our policies or change our underwriting tool to address those concerns?" Loan performance over time is telling. But it can take time for things to develop. So, we need to monitor very closely and act as quickly as we can. Sometimes, a borrower’s ability to keep a home is challenged despite their best efforts. Which is when we try to help them with different options that can be considered to find a potential solution. In the grand scheme of things, we're walking the walk when it comes to making "home" possible. Consistent with our mission, we are providing liquidity, stability, and affordability. That comes not only from getting people into homes but making sure that they can sustain their homeownership. What should lenders and servicers be thinking about to stay on top of new risks? A lender’s employees also need to be able to point out where they see weaknesses in controls and feel empowered to identify new trends on their own. Loans that have trouble embedded in them, are going to flow to companies that have the weakest risk and control environment. So, having a strong culture will help make sure that lenders and servicers don't end up being that weakest spot. What does a typical day look like for the risk management team at Freddie Mac? We have a diverse team of nearly 500 employees in my department, with a wide range of responsibilities. We're all using our expertise to help our clients responsibly grow their business. This ensures we don’t have a typical day at the office. Some of the things that we do every day include analyzing the deliveries of new loans, performing quality checks on those loans, writing and revising credit policies based on the trends that we're seeing in the marketplace or where we think the market is going. We have teams fully dedicated to innovation and new risk management capabilities to be able to bring value to our clients. We also have counterparty of risk experts who evaluate the financial health of our sellers' servicers. And lastly, we also have data scientists and modelers who bring smart lending down to a science.